Lately I have been playing Monte Cook’s Dead Gods super module to Planescape, that he wrote back in 1997. It is a module filled with intestering ideas and concepts using the Planescape setting to its fullest – and also in a sense revealing how Monte got the ideas for Numenera. One Does Not Simply Play Dead Gods. Its black pages are guarded by more than just orcs. There are narratives there that does not sleep. The great story line is ever watchful. It is a barren campaign, riddled with vague ideas, nonsensical plotlines and superfluous ideas. The very pages you read is a poisonous fume. Not with ten thousand sessions could you do this. It is folly. 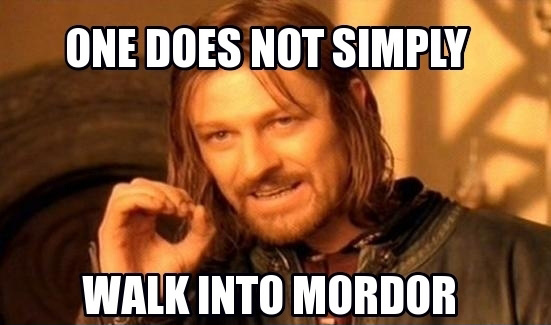 Boromir on playing Dead Gods. Whether the PCs follow Renik or Kair-aama, they eventually see their mark meet with something in the dark shadows of an alley near High Point. If the cutters keep watch for several evenings, they observe a number of secret meetings and finally see the true “face” of their enemies. 1. The text assumes the players will choose to observe a number of secret meetings – without giving the slightest hint as to why. 2. The text does not bother with describing who’s participating at these meetings, the above text is the full description about the meerings. 3. The text does not explain what is happening at these meetings. Again the quote contains more or less everything mentioned about the meetings. 4. The text does not allow for any other action. What happens if the PCs follow any of the participants? Not an option. What happens if the PCs interferes with the meetings? Not an option. What happens if the PCs investigates the participants at the meetings? Not possible. If the players want to do anything beyond “keep watch for several evenings”, then the scenario leaves no clue as to what happens or how to play it out. 5. The whole next sequence hinges on the fact, that the players choose to observe for several evenings, until they see the monster, and then their choice is to neither keep observing or interfering with the meeting, but to solely track the monster – which they have never seen before, and they don’t know what the monsters are up to beyond appearently killing people and taking their place. 6. Once the players have decided to follow the monster, which is the only option (well, technically they can choose otherwise, and the module has at the end of section a brief note on what to then, which is mainly just to skip ahead and then continue the events, as nothing had happened – oh, wait, nothing did happen), then the NPCs and the secret meetings are simply forgotten by the module, as it no longer cares about it. This is not for the players to care about any longer. This happens multiple times in the module – once the characters have seen or witnessed something, the characters are ushered on not letting the players investigate them (and neither leaving any info to the GM, should the players decide to look closer). There are descriptions of places and NPCs and plots and ideas, that one can steal, but you cannot play Dead Gods without forcing the actions of the players, and if playing the module as written you leaving the players in the dark most of the time having them play several chapters without knowing who, what or why they’re are exploring and fighting them – and it is not fun, just frustrating. No wonder why 90’s modules have such a bad rep.
Hey, sounds not unlike Hoard of the Dragon Queen in a lot of ways. I guess so. I have read a few reviews of Hoard of the Dragon Queen and they haven’t been too favorable complaining about assumptions about how the players’ should choose to act. Creating a pre-written campaign with a strong narrative arc is appareantly a whole lot more difficult, than most of the publishers assume.